- Live music by TC's own Jim Hawley! - Door Prize Drawings every 15 minutes up until 1:45/4:45 PM; Check the boards by the door prize display and near the exit to see if you've won! Must be present to win. 2:00 PM - 2:30 PM - Festival closed. 5:00 PM - Event Ends, see you next year! And before you leave, please fill out the survey so we can contact you for future events, and to help us traack our promotional budget. AND get in the drawing for the surprise Chocolate Sculpture by Tess Notke! **Admission ONLY at your ticketed time. Thank you for your cooperation. 10 years of chocolate! How many years have you been part of the Traverse City Chocolate Festival? 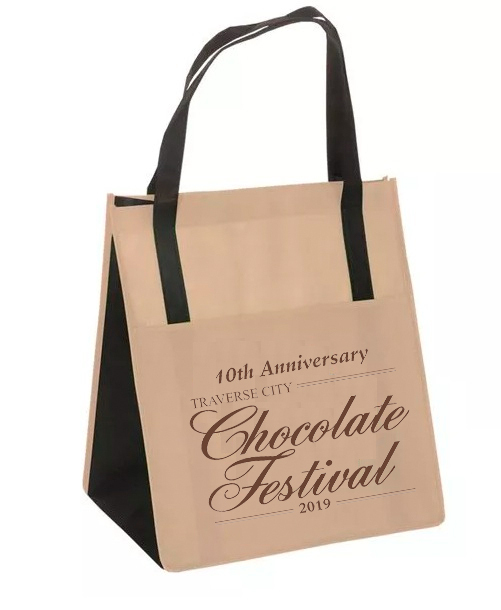 This year, to extend the memories, we are offering a commemorative tote bag. Roomy enough for chocolate and more, it measures 13” W x 15” H x 10” D; it is made of 85 GSM polypropylene, and is 100% recyclable and hand washable; and it has an outside pocket. Purchase of totes at the door depends upon availability. ONLINE TICKETING IS NOW CLOSED! The number of tickets is limited for each time. Tickets will be sold at the door while quantities last. It is recommended that you purchase early. The event did sell out in the past. That’s how GREAT it is! Attendees will receive a Sampling Coupon for one sample from each Exhibitor. credit cards accepted by most exhibitors. • Allow the exhibitors to give you your samples. Please don’t help yourself. • Start “anywhere” and move throughout the Festival area. • Be polite and courteous so everyone can enjoy the event. • If you have questions or concerns, check with one of the Volunteers. • Fill out the survey so we can contact you for future events, and to help us track our promotional budget. Don't leave for home without it!